From the get go I was hooked, the show manages to leave behind the faults of other programmes with their repetitive nature and instead include a ongoing narrative with sub- plots that weave into the main story. The acting and casting is perfect that makes you actually feel for the characters, unlike with Gotham, with the humour of Foggy being a relief from the tortured soul of Matt Murdock. D'Onofrio is perfect as Fisk and is different from any villain i've seen and Karen Page is a great character who has fallen victim to the violence in Hell's Kitchen. There are shocks and twists to enjoy but it's the fight sequences that amaze, when you see episode 2 you'll understand. Bring on season 2. Most superhero shows follow a pattern of clich辿s that involve an weekly enemy and one big boss throughout a season, and the hero goes through his ups and downs gradually. 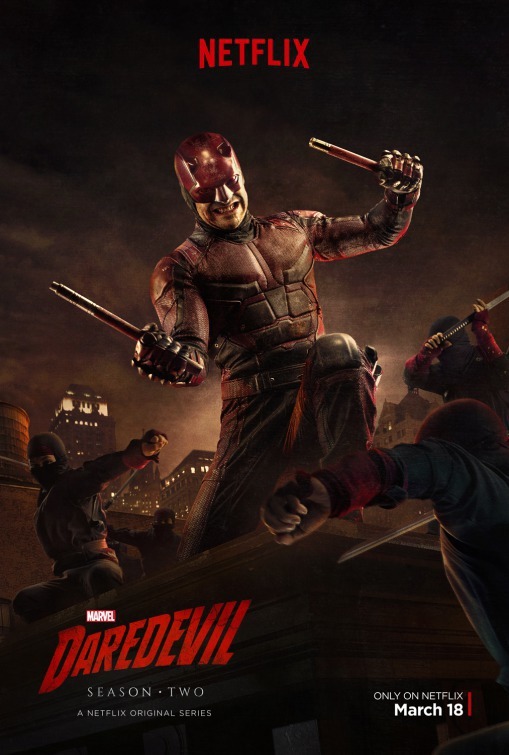 Some shows follow this formula to the letter, but shows like Daredevil don't pander to the "Hollywood story". Not only does this show have an unpredictable story, and strong dialogue, but every episode follows the one before it, with ties and references slowly being collected. The ingenuity of the show falls to its script writers and directors. The choreography of the fight scenes are superior, mainly because they show exactly what damage the hero gets from his wounds. Matthew's superior powers are used subtly in this show, there's no definite advantage in his fights - he always gets through it with some scratch or another, and sometimes he doesn't win at all. This makes the imagery and tone of the story far more realistic and believable. What strikes me best about the series is its characters. There are no "tick-list" characters involved here. Yes, there's a hero, and yes there's an enemy, but that's as far as the basics go. There's a deeper issue and past with each and every character. Also, female characters are treated with respect - no more damsels in distress,, these are people fighting for their survival and they won't be sitting around screaming for someone to help them. The reason I gave this ten is simple, the story is as visceral as those shows that conquer the media these days. Breaking Bad and Game of Thrones are two worthy shows that take careful steps to grab their viewers. This show is similar, in that it goes far enough to make us feel a little unsettled. They're not afraid to show us Matthew's harsh and depressing past, and in the most gut-wrenching way, and they're not afraid to show us the full calibre and might of this show's nemesis, Wilson Fisk - who by episode four is already making an impression. If you're a fan of Better Call Saul, Game of Thrones or The Flash even - this is a show for you. One minor fault in the series for me, however, has been Elden Henson's acting. But he doesn't appear that often. Yes, it takes place in the Marvel Cinematic Universe (MCU) with such films as Iron Man (2008), Captain America: The First Avenger (2011), The Incredible Hulk (2008), and The Avengers (2012), as well as the TV shows Agents of S.H.I.E.L.D. (2013) , Agent Carter (2015) and Jessica Jones (2015). As well as upcoming series Luke Cage (2016), and Iron Fist (2017). The show also makes several references to the Avengers film. Such as "after new york was destroyed", or "unless he has a suit of iron or a magic hammer". Ben Urich's office also contains framed newspaper covers featuring the events in The Incredible Hulk and The Avengers. Season 1 has been confirmed to take place three years after The Battle of New York. Stick enlists Matt's help to destroy "Black Sky," a weapon that the Japanese mafia, led by Fisk's associate Nobu, are bringing into New York. Matt agrees on the condition that Stick restrain himself from killing anyone, but Stick breaks his promise when it is revealed that Black Sky is a young boy being held in a shipping container with chains around his neck and limbs. Stick fails to kill Black Sky while at the docks with Matt, but later says he killed the boy further up the road. Stick does not go into detail but says that the boy was more than "just a boy" and that Matt would have sensed this had he not been emotional at the moment. Black Sky is not a term previously found Marvel Comics so there is no clear parallel to be found there at this time. What exactly the boy named Black Sky is and how exactly he is a weapon is not revealed as of the first season of Daredevil, and any fan theories are pure speculation. In season 2; Elektra is revealed to be the Black Sky. There has still been no confirmation on who or what the Black Sky actually is.